Teton Advisors Inc. is an asset management company with $1.4 billion under management that was spun off from GAMCO in 2009. The company retains close operational ties with GAMCO, and is majority-owned by Mario Gabelli. Teton has been extremely successful in increasing its assets under management and earnings. The business of managing mutual funds and separate accounts is a great one for several reasons. Returns on capital are outrageous because capital requirements are so low. No expensive factories or physical storefronts are required, just some office furnishings and software. An asset management company’s greatest assets are its employees, brand name and relationships, none of which appear on the balance sheet. The asset management business is also scalable at little marginal cost. Unlike a manufacturer or retailer, which must build additional capacity in order to increase revenues, asset managers can increase assets under management by the hundreds of millions without significant capital expenditures. What’s more, the additional revenue drops to the operating income line at a high rate, since operating costs do not increase proportionally. That said, asset management has some drawbacks. Investors can be fickle, chasing a hot manager and abandoning a poor performer. Even a short period of underperformance, which all asset managers will occasionally experience, can lead to huge client withdrawals and declining assets under management. Retail investors in particular tend to be pro-cyclical, withdrawing assets during down markets and reinvesting during up markets. Asset management companies are often strongly dependent on a few key staff, such as a star investment manager or team. The high demand for investment talent (or, let’s be honest, talks-a-good-game-on-CNBC talent) gives rise to extremely personnel costs. Employee compensation is typically an asset management company’s biggest expense. Teton Advisors currently manages seven open-end mutual funds, in partnership with Westwood Funds. Four of these are equity funds, one is fixed income and the other two are blended. Teton also manages separate accounts. The chart above shows Teton’s offered mutual funds, with performance for the institutional share classes. Clearly, the Mighty Mites fund is Teton’s flagship product. Performance has been exceptional and the fund has been managed by Mario Gabelli and Laura Linehan since 1998. The Equity, Balanced and Intermediate Bond funds are sub-advised by Westwood. Teton assumed management of the other funds more recently. The small size of the other funds may be by design: many companies will seed a small fund with their own money and hope performance is solid. If it is, the fund is heavily advertised and promoted through distribution channels. Inflows eventually increase the fund’s AUM to to point where it is profitable. A small, poorly-performing fund is eventually quietly liquidated or merged with another fund. Teton’s assets under management have increased from $449.8 million at the end of 2008 to slightly more than $1.4 billion at March 31, 2013. $556.5 million of the increase has come from net inflows, and $421.5 million is the result of market returns. This increase in assets under management equates to 31.2% annualized growth since the end of 2008. Stripping out market gains, net inflows have created annualized growth in assets under management of 20.9% annually. Teton’s continued increase in assets under management has resulted in serious earnings growth. In 2008, earnings per share was $0.55. For the twelve trailing months ended March 31, 2013, earnings per share was $1.53. Because of Teton’s swift growth, looking at the twelve trailing month period underestimates Teton’s earnings power. For the most recent quarter, revenues were up 29.2%, leading earnings to increase 13.3% year-over-year to $0.49 per share. (Teton bought back a large block of shares in 2012, leading EPS growth to outpace net income growth.) Assuming assets under management and costs remain stable, Teton could earn $1.96 in 2013. Teton’s operating margin in the most recent quarter was 30.2%, a decrease from 34.6% a year before. The culprit was compensation expense, which rose 72.3%. Even if these elevated compensation expenses are ongoing, a 30%+ operating margin is still outstanding and shows just how profitable an asset management practice can be. Teton’s balance sheet is barely worth mentioning. At quarter’s end, Teton’s total assets amount to $2.38 million, with $0.98 million in equity. The company has no debt and nearly all assets are current. Teton Advisors shares have traded between $16.80 and $25.00 over the last six months. The current bid/ask is $19.00/$32.00. Assuming a share price of $25, Teton trades at about 12.8 times forward earnings. 12.8 times earnings represents an earnings yield of 7.8%, fairly appropriate for a low-growth company. But Teton’s history shows it is anything but low growth. Teton will have a more difficult time growing its AUM at 30%+ over the next several years. After all, going from $500 million to $1.4 billion in assets under management is a lot easier than going from $1.4 billion to $5 billion. However, a more reasonable rate of growth is certainly achievable. Teton’s historical growth rate due to net inflows is 20.9%. Achieving just under half of that, 10%, plus 5% annual market returns would push assets under management to $2.8 billion in 5 years. Assuming earnings doubled right along with AUM, Teton’s EPS at that point would be $3.92. The same 12.8 P/E ratio would mean a share price of $50.18. Teton’s 2012 dividend was $0.60 per share. Assuming dividend growth tracks earnings growth and the share price in five years is $50.18, investors buying at $25.00 would make an attractive annualized return of 17.7%. Again, some of these assumptions are very conservative. 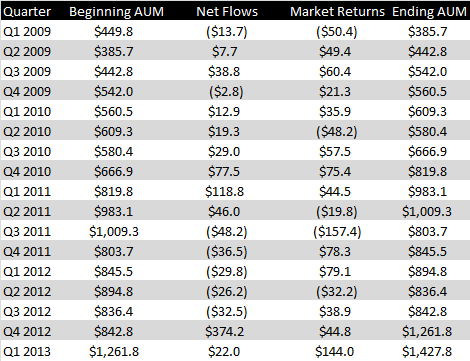 10% annual growth in AUM from net inflows is less than half the historical rate, and a 5% annual market return is also below historical averages. Also, Teton will likely reap from efficiencies from higher revenues, which could increase margins and speed earnings growth. Teton Advisors remains tightly interwoven with Mario Gabelli and GAMCO. The two firms’ relationship is extensive, with many related-party transactions disclosed in Teton’s reports. (The transactions are mostly reimbursements for funds distribution and outsourced corporate functions, and do not seem untoward.) To some extent, Teton’s fortunes are intertwined with Mr. Gabelli’s and GAMCO’s. I view the tie-in with Mario Gabelli as a positive. Mr. Gabelli’s long-term record as an investor is exceptional, and another company with high ownership by Mr. Gabelli (LICT Corp.) is one of the largest positions in my portfolio. I expect him to make money on LICT and Teton Advisors, and I’m happy to invest alongside. Investors should also weigh the long-term outlook for the actively-managed mutual funds industry. The certain advantages of ETFs and other cheap, passive investments are well known and the eventual death of retail investor-focused active funds management has been predicted by many. On the other hand, every additional dollar invested in indexing strategies increases the opportunity set for active managers with true skill. Teton Advisors is fairly illiquid, but a patient investor may be able to pick up shares at attractive prices by waiting for an impatient seller. No position, may add opportunistically. Gabelli actually owns twice what you noted. He owns about 300,000 Class A shares and 300,000 Class B shares. The CEO is on track to earn about 260,000 shares. That is about 78% of outstanding shares. Having Gabellis as a fellow shareholder is a positive. Public float is probably around 150,000 shares. They wisely bought back 200,000 shares from Westwood Holdings (WHG) for just $9.50 per share in 2012. If either their MidCap fund or MidCap SMA’s take off AUM could grow even faster than it has over the last few years. Thanks, Tim. I am going to change the text of the post. I missed the class Bs. I agree that buying those stakes back from Westwood was a great move. The current CEO is certainly incented to perform well. Great post, you make a lot of valid points. 3rd quarter financials are out. EPS continues to rise. AUM continues to grow rapidly. Now at $1.8 billion. They are adding to staff. It will be interesting to see if they can continue to grow the SMA side of the business. If they can, it could ramp up AUM very quickly even though it is at a lower management fee than mutual funds. Liquidity has disappeared.